Regrettably, on opening night, much of the first act was plagued by intermittent sound issues. For a musical about a close-harmony group that’s mostly a trip-trop down musical memory lane, that was a considerable problem. In the second act, after it was fixed, we got to enjoy a more Temptations-like sound and it lifted my spirits considerably. 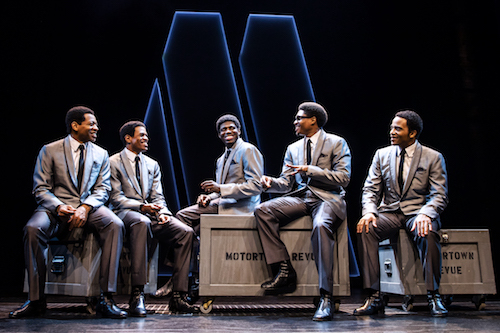 The “plot” of this musical is more or less a narrated history of various members joining and leaving the group, with some Motown history thrown in (Smokey Robinson v. Norman Whitfield!) and a scant teaspoon on American Civil Rights Movement over top, so the songs are the draw. The singers, for their part, did a very nice job of it. All of the Temptations, in their turn, have plenty of vocal talent and estimable bass Jawan M. Jackson is playing Melvin Franklin again after playing him in Motown: The Musical (it makes sense, Jackson has a deep rich pudding of a bass voice that’s a perfect match for this type of music). They can all sing the catalog very nicely indeed, and gosh oh golly they can dance, too. The Supremes, led by a completely delightful Candace Marie Woods as Diana Ross, brought a lot of pizazz to the stage as well. Marquell Edward Clayton, though not in a singing role as manager Berry Gordy (and trapped behind a desk most of the performance) had a young Taye Diggs quality about him that was easy to appreciate. Derrick Baskin, playing Otis Williams, the originator/backbone/leader/chief scold/daddy of The Temptations, has both too much and not enough to do in Ain’t Too Proud. He narrates the action, such as it is, doing his best with a lot of as-you-know-Bob dialogue and trying to lighten some of the onslaught with some light vaudeville mugging but eventually I was just exhausted by it. When he’s allowed to do a little actual acting it’s quite nice, but usually over much too soon (and holy wow, do they cram dialogue into his acting parts, as if he can’t be trusted to just act his emotion and must narrate them all). He does his best with it, though, and since his best is pretty good that helps a lot. I must take a moment to single out Projection Designer Peter Nigrini for tremendous work here. I was crabby and skeptical about the set as I arrived, peering with suspicion at a bare stage, but he absolutely killed it. The projections gave life and dimension to a show struggling to animate itself, and I appreciated his work in particular here. Ain’t Too Proud, at the end of the day, was always going to be a musical for people who loved The Temptations, and are excited to hear their music performed live (or at least willing to; it has escaped no one that, like Jersey Boys, Ain’t Too Proud is at least partly a way to get straight men over 60 to agree to see a show). It does that and a little more, too.